At last... something finished to show you! 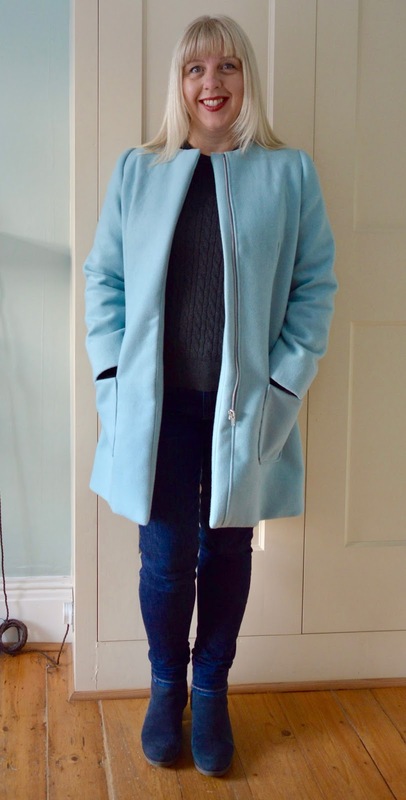 This is the Chloe Coat from Sew Over It: a classic collarless coat with lined, patch pockets, an open ended zip, tailored shoulders and long front darts. There's nothing super fancy about the design, it's just a simple, elegant style that's totally wearable. I'm very happy with mine! 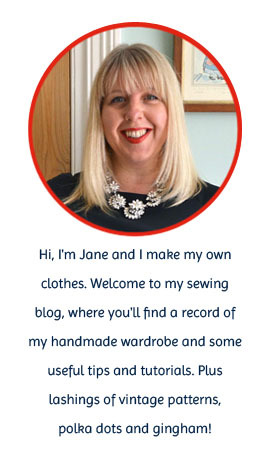 The pattern is part of the Intro to Sewing Coats online course and I'll be writing a separate post reviewing the course shortly. This will include lots more detail about construction and the techniques used in the course. I was fortunate to be able to try on a sample of the coat at the Knitting & Stitching Show this year, which was great for checking the size. The sample was a size 10, and although it was a good fit across the back and shoulders etc, when I tried to zip it up it was far too tight across the bust - imagine a sausage squeezed into a skin! I also wanted a bit of additional room for winter layers under my coat so decided to cut a straight size 12 all over. I made just two small adjustments to the pattern, I shortened the sleeve length by 6cms and re-positioned the pockets about 2.5cms higher to allow for my short arms. It's also worth pointing out that I didn't shorten the coat hem which is normally a standard adjustment for me. 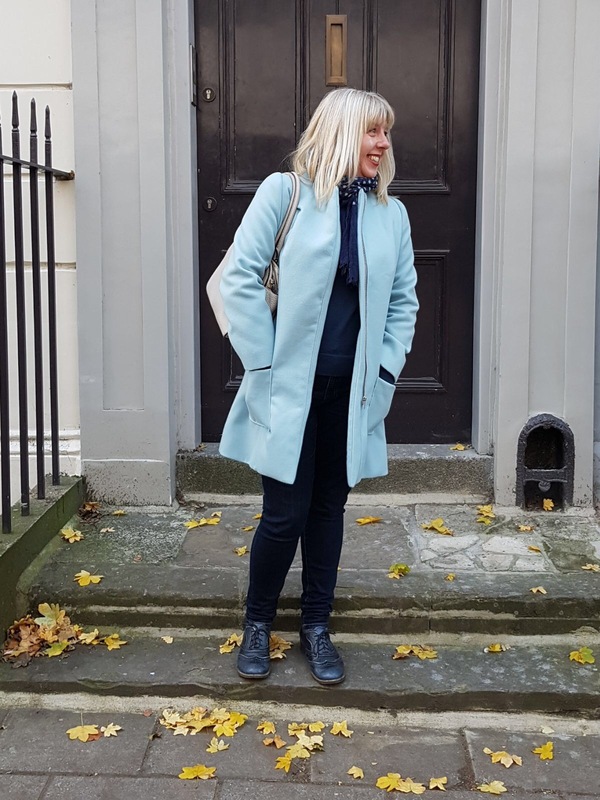 You'll note from the photos that the coat finishes well above the knee on me and I'm only 5'2", so if you're taller or prefer a longer coat you may want to lengthen the pattern. I love the roomier fit, it's much more comfortable when you're bundled up wearing layers of knitwear. I also far prefer the patch pockets to in-seam pockets. The last coat I made had in-seam pockets in the side princess seams and having worn it quite a lot, I do feel like they're positioned too far back. The main coat fabric is an acrylic/wool mix from Doughty's (no longer available I'm afraid) and I was able to cut out the whole coat comfortably from 2.5m. As I wasn't originally intending to make a coat, I wanted to save costs by using a lining from my stash. There was just enough polka dot lining fabric left over from my Abbey Coat (which, incidentally I never wear, anybody want it?!) so I used that. 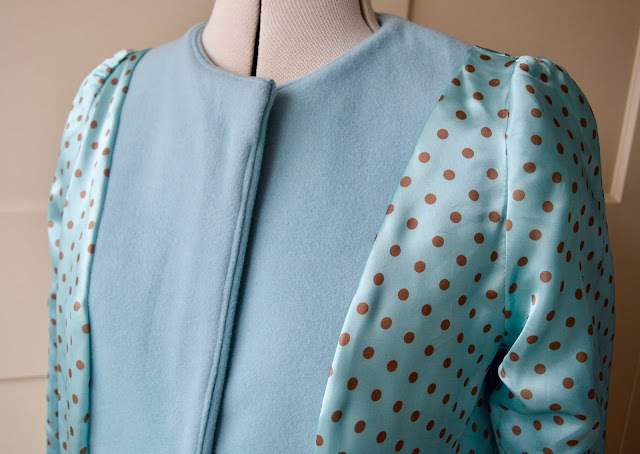 Luckily for me it's a perfect match with the baby blue coating and a really good quality lining fabric to boot (originally from here), so it was all a bit fortuitous. The other notions needed for the coat - an open-ended zip, tailoring interfacing and, wait for it, ice wool - I purchased from Sew Over It. Because of the nature of the online course I sewed the coat in small chunks, which corresponded with the video tutorials. 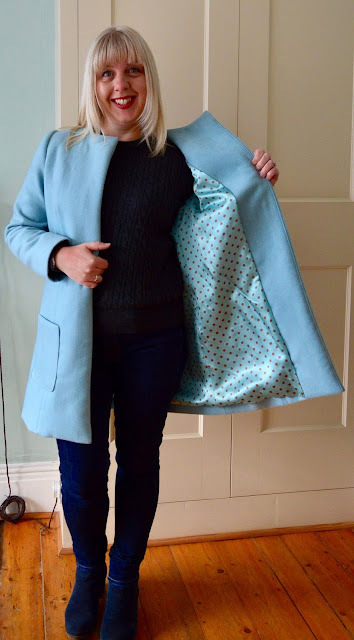 It's a great way to take on a large project such as a coat, which can seem quite daunting, or if you're simply short of time and need to fit your sewing around short bursts. The only step I didn't incorporate is the top stitching down the front edges of the coat. This wasn't a design decision, it was simply because I couldn't fit the layers of coat front and facings under my sewing machine! If I had the choice I'd have definitely included the top stitching as the front facing does has a tendency to curl round (see last photo). Thank you to my friend Joe for this lovely picture of me (and my coat) in Lambs Conduit Street last week. Absolutely gorgeous and timeless! This is beautiful, Jane, and the color is fabulous on you. It’s stunning! You look wonderful in it. The lining matches the fabric perfectly too. It's absolutely gorgeous! Happy wearing!! Beautiful colour and that lining! wow gorgeous :) I love the style of this coat - simple, elegant and practical all at once. Gorgeous! Stunning coat and I love the colour. You've done amazing job. I'm looking forward to seeing your review of the course. Such a beautiful coat! Love the colour. It's just beautiful and that lining... perfect! I have to say your coat looks expensive and it's great how you can create items like this that would sell for hundreds in a shop.